This winter I found myself in a bit of a low place. I often lost patience with the kids and was not disciplining effectively because of that. I would then feel guilty, ask forgiveness, try to start over. It seemed like a cycle with no end in sight. Homeschooling was harder and more draining than I anticipated, in our small house I felt like we were on top of each other all the time, and the winter blues were upon me. Deep down in my soul, I was struggling to find joy each day. The mundane just seemed to be crashing in and the days were a string of cold and grey. 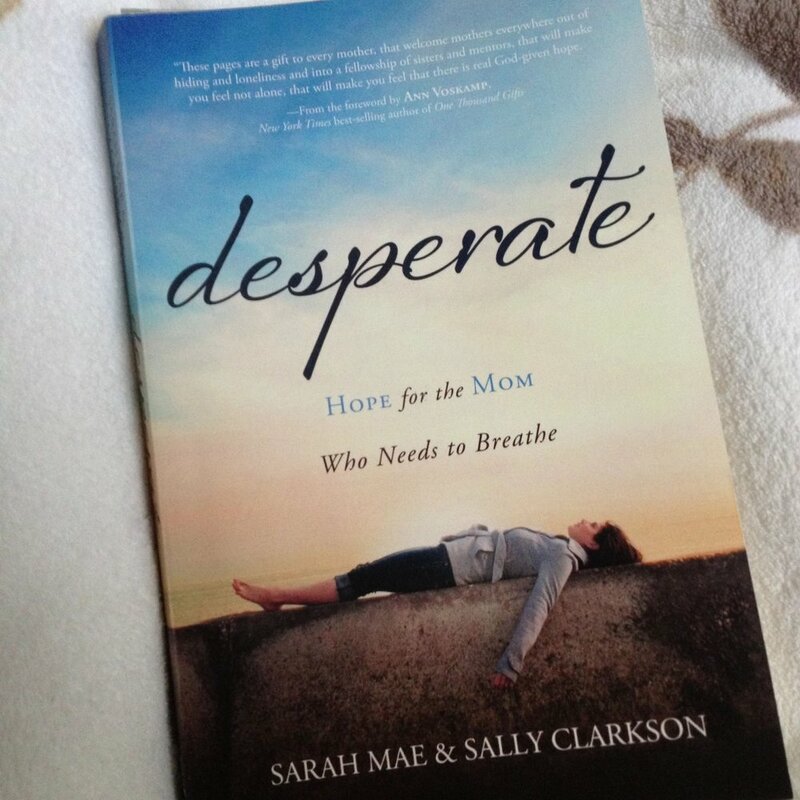 During that time I picked up Desperate: Hope for the Mom Who Needs to Breathe. The authors, Sally Clarkson and Sarah Mae wrote a book that was life-giving and inspiring to me! Desperate is written by a young mom (Sarah Mae) and a mom with grown-up children (Clarkson). Each chapter is constructed as a give and take between the two women, one from the point of view of being in the thick of child raising and the other looking back with grace and wisdom to offer. Primarily, this book is written to women with young children, but there is a lot of wisdom within it's pages for all mothers. This book is not a how-to manual, a formula for parenting, nor is it particularly practical. While there are practical suggestions, I mainly found it inspiration to forge my own path as a mother by creating meaningful relationships with other women for support, creating a home with a unique family culture, realizing I have limitations, and staying close to Jesus and following His example for my life. "A woman alone in her home with her ideals eventually wears down and becomes a perfect target for Satan to discourage. Some women have journeyed alone for so long they are not even aware of their urgent need for mentors, friends, peers, and fellowship." She encourages women to make friends with peers, as well as older women who can offer encouragement, and younger women who need friends. Clarkson doesn't let me feel sorry for myself if I feel unincluded by others: "I have had to start almost every group to which I have ever belonged," Clarkson writes. "One of the first lessons I learned was not to be discouraged if others did not invite me. In this individualistic culture where everyone is too busy and overwhelmed with life, the groups in which we find community will inevitably be the groups we start ourselves." I appreciated the emphasis on creating my own family culture. Although I love social media, Facebook, blogs, Twitter, and Instagram may tempt me to compare my way of life with someone else's and end up feeling like mine doesn't measure up. I may feel like an underachiever, uncreative, and unable to multi-task if I constantly look at what other families are doing through the lens of comparison. "Every family's puzzle will be different," Clarkson wisely reminds me. "We can only please God if we listen to His call on our lives. Each of us has a different personality, different strengths and limitations, and different passions and stewardships. God gives us great freedom to exercise wisdom and authority in order to rule over our lives and make the productive for our own families." Clarkson encourages deep thinking and planning of your own family culture. What do I want to instill in my children? "God has made each couple with the freedom to create their own family culture." Another theme was to live "within the limitations of our own personalities." Today's cultural message--especially to women--is to be everything to everyone. Work successfully, have time for yourself, raise children, volunteer, have a hobby, exercise everyday, and the list goes on. But the fact is there is only so much time in one day. Different people have different capacities for the amount they do and the level of stress they can operate effectively under. We can not do it all. "It is vitally important for women to learn how to think biblically for themselves instead of being enslaved to other people's thoughts and opinions. To truly follow God with everything in our lives, we must learn to develop discernment." Instead of seeing limitations as a negative, Clarkson sees them in a positive light: "You have your personality for a reason--probably for the special work He has for you to do in this world. We have great freedom to live within the confines of our own personalities. The more we learn to accept our own limitations, and the limitation and vulnerabilities of our children, the more able we will be to give our children from our strengths, rather than our weaknesses. Our happiness spills over into our parenting and creates children who feel loved and accepted." Desperate encourages us mom's to "unpackage" the evidences of God's love in the mundane moments of motherhood. The book also reminds me that the very act of mothering is an act of worship to God. Although it may not feel like it, it is a spiritual service. Clarkson encourages women to not look to others, but to Jesus as the source of our inspiration to parent by looking at "the way Jesus was willing to lay aside His life to serve and love His disciples and those around Him, and to invest in their lives." Clarkson also reminds me that I will fail, again and again, but that through this very work of mothering God "shapes us into His own images along the way." She shares that she learned to "live in the reality of Romans 8:1-2: 'There is therefore now no condemnation for those who are in Christ Jesus. For the law of the Spirit of life in Christ Jesus has set you free from the law of sin and death.' "
Although I'm sure that I will continue to have some of the same struggles I had over the winter in the future, Desperate, has inspired me to be more purposeful in this mothering journey. To find other women who can speak into my life, to create my own unique family culture, to live within the limitations that are specific to me (and not apologize for them), as well as to have a vital, living relationship with Jesus.